Height: 6' 2" / Weight: 195 lbs. Captain John Sheridan, currently commands Babylon 5.
of the Earth Alliance destroyer Agamemnon, until his transfer to Babylon 5 in 2259.
by the Shadows, but was brought back to life by the first of the first ones, Lorien. Shadows, and restore peace to the galaxy. Height: 5' 9" / Weight: 130 lbs. also a member of the Babylon 5 War Council. 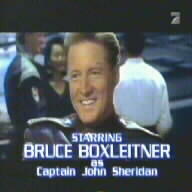 member of the Babylon 5 War Council. Height: 6' 1" / Weight: 185 lbs. and Xenobiologist. His specialty is Xenobiology. Height: 5' 6" / Weight: 125 lbs. Shadows. A romantic relation is building between the two. piece of Kosh still exists within Captain Sheridan. G'kar's help in his assassination plans, Londo agreed to grant freedom to Narn. Ambassador Mollari enjoys gambling in the Zocalo, liquor, and women. Height:6'1" / Weight: 220 lbs. to Babylon 5, and indeed may join the War Council. in exchange for freed for Narn. Height:5'8�" / Weight: 150 lbs. 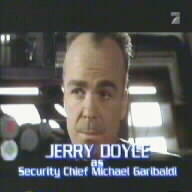 Babylon 5 in 2257. He is a trusted aid, and friend. Height: 5'10" / Weight: 210 lbs. share a few moments in the Zocalo from time to time, discussing their troubles. Height: " / Weight: lbs. the Wilderness" (part 1) and originally played by Louis Turenne.